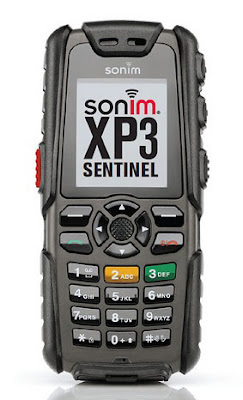 Sonim XP3 Sentinel is new ultra rugged mobile phone designed with 176×220 display, FM radio, 2MP camera, integrated GPS receiver with SiRF InstantFix, Bluetooth Man Down sensor, microSD card slot and LED torch light. Designed with hardened rubber moulded into its casing using dual injection process. Sonim claims XP3 Sentinel confirm IP-67 rated and meet MIL-810G standard for salt, fog humidity, transport shock and thermal shock. Sonim XP3 Sentinel also carries waterproof property beside shock and scratch resistant for its Gorilla glass screen. Sonim’s XP3 Sentinel supports tri-band GSM/EDGE networks. It has a dedicated red emergency button that can send a GPS location and call the Emergency Response Center even when the phone is locked, an amber button to request monitoring and tracking as well as a green button to track the start and the end of a shift. Keeping you safe - The Sonim XP3 Sentinel. Built For Life- no matter how harsh the situation, the Sonim XP3 Sentinel is the ultimate safety phone for lone workers in extreme environments. Engineered with Sonim's legendary ruggedness in mind and equipped with high performance GPS, outstanding battery life, a LED torch, a 2MP camera and a state of the art accelerometer the Sonim XP3 Sentinel goes beyond extreme durability. The Sonim XP3 Sentinel contains built-in software for lone worker protection and a man-down motion sensor that detects impact, tilt, free fall and no-movement. Key safety functions are the dedicated red emergency button that can send a GPS location even when the phone is locked, an amber button to request monitoring and tracking when worried as well as a green button to track the start and the end of a shift. Fully water submersible (IP-67 rated) and MIL-810G certified for its resistance to extreme environmental conditions and of course it's backed by Sonim's industry-leading 3-Year Unconditional Guarantee, the Sonim XP3 Sentinel will keep you safe and connected - no matter where you are.